Minimum 50% aggregate marks, (45% in case of candidates belonging to the Reserved category) in a three-year Bachelor’s degree (or equivalent) recognized by the Association of Indian Universities / AICTE. Candidates who will complete all requirements for the degree by 16th June 2013 may also apply. If an applicant does not complete all the requirements of his degree by 16th June 2013, or does not obtain 50% aggregate marks in his degree, the offer of admission made to him will stand cancelled. The intake capacity for full time PGDM course is 240. The qualifying cutoff for each year is determined on the basis of the scores of the applicants to the Institute, in the entrance test in that year. For admission to the post graduate programme in business management 2013-2015, only those candidates who register for the XLRI Admissions Test XAT 2013 of Xavier Labour Relations Institute, Jamshedpur or CMAT - 2013-14 (First Test and/or Second Test) of All India Council for Technical Education, may apply. 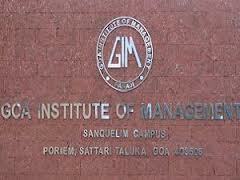 Goa Institute of Management will not be able to consider candidates appearing for a competitive examination, if scores are not available latest by 5th May 2013. Applicants to GIM are required to take the XLRI Admissions Test XAT 2013 or CMAT - 2013-14 (First Test and/or Second Test) of All India Council for Technical Education. Apply online - Last date for online application is 31st December 2012. Candidates who have applied for admission to GIM will be shortlisted on the basis of their XAT or CMAT scores, past academic performance and work experience. The shortlisted candidates will be called for face to face evaluation process for final selection in February/March 2013. The final selection will be made tentatively in April 2013 on the basis of competitive examinations XAT or CMAT scores (50% weightage), the candidate’s past academic performance (10% weightage), performance in face to face evaluation process (30 % weightage) and work experience, if any (10% weightage): This is Subject to desired proficiency in written communication and a minimum score for each evaluation component, except work experience. The session would begin in the first week of June 2013. The qualifying cut-off XAT / CMAT score will be lowered by 15 points for candidates of Goan domicile/origin. Documentary evidence of domicile will have to be supplied along with the completed Application Form. Please note: Admission to the Goa Institute of Management is strictly on the basis of merit and no donation in any form is sought or accepted in connection with admission. Ragging is totally banned at the institute, anyone guilty of ragging and/or abetting ragging is liable to be punished. Orders of Government and of Hon'ble Supreme Court on the Anti-Ragging measures are completely followed.